There is no best time to go, but most people will trek the Tour du Mont Blanc during the summer from the end of June to the middle of September. At this time, most of the old winter snow will have melted, the weather will be warm and the hotels will be open. If you try to go too early there is likely to be too much snow lying around and if you go to late most of the hotels will be shut. The other factor is how busy the trail will be. Undoubtedly, the trail is at its busiest in early August when many Europeans take their annual holiday and the weather is perceived to be the best. It is not sensible to try the Tour du Mont Blanc earlier than the middle of June, although some people do. They key problem of going too early is that you will encounter patches of snow left from the winter and some of these patches can be very large! This presents hazards to hikers who would describe themselves as summer walkers and do not have the requisite skills to either safely cross the snow patches or know what to do in case of a slip. The old winter snow is bullet-hard and if you slip you could slide a long way and possibly hit a rock, leading to all sorts of nightmare scenarios. The snow will only soften and melt with help of the summer sunshine and some years summer can be later than normal. Some of the snow patches can be huge and, if it has been a hard winter as it was in 2013, you will find yourself walking on snow for 2-3 hours when crossing the mountain passes such as the Col du Bonhomme or Grand Col Ferret. 2013 was a long, hard winter and the warm weather did not arrive until early July. Conditions like this are dangerous due to the likelihood of a slip and also the chance of being swallowed up into the deep snow: some trekkers have literally fallen into deep ‘man-holes’ of snow and taken a very long time to get out. 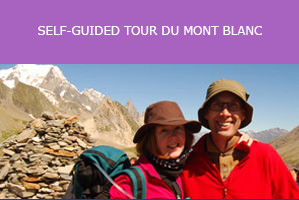 Assuming the winter has not been hard, late June is the best time to consider starting the Tour du Mont Blanc and has the added bonus of quieter trails and all of the Alpine plants coming into flower. At this time, there is still snow much higher up in the mountains and so the wildlife, such as bouquetin or chamois, will naturally be found on the lower slopes: it is not uncommon to see them at this time of year. The hoteliers are also in better moods as they tend to get ground down as the season progresses! 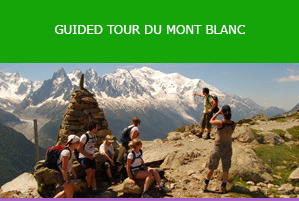 July and August are good time to hike the Tour du Mont Blanc as the trails will be clear of snow and the weather will generally be good. However, late July and early August are still traditionally when Europeans take their annual holiday and so the trails can be quite busy. It is not uncommon to see up to ten groups leaving one village at a similar time and this causes traffic jams for the first half of the morning. Many groups trek in an anti-clockwise direction and so by travelling in a clockwise direction you can avoid this. Salamander Adventures trek clockwise precisely because of this reason. The number of people on the TMB is, however, limited by the number of beds in each village: and so there is a finite number of people you will find on the trail. The weather in July and August generally follows a pattern of hot days that become more humid as the day progresses and end with a thunder storm, often with spectacular lightening shows. You should also expect frontal weather from the Atlantic Ocean bringing rain storms and cold fronts: this tends to happen once or twice a fortnight. September is generally a much calmer month and the weather is generally more stable, often characterised by a long period of high pressure. This gives long days of fine weather and evenings that are cooler than in June, July and August. The trails will be quieter and you will see the beginnings of Autumn with golden colours coming out and lots of mushrooms at ground level. In theory, it would be possible to extend the season into October, but hotels in one or two key villages shut around 15-20 September and so makes the trek not possible. The Ultra Trail du Mont Blanc (known as the UTMB) is an annual running race when athletes compete on the 165km long TMB – some in under 20 hours! It normally runs in the last weekend of August and attracts over 5000 runners and all their families. It means that many of the hotels – particularly in Chamonix and Courmayeur – are full and it is very difficult to secure accommodation. It would only be sensible to try and do the TMB at this time if you book your accommodation via a reputable trekking company. It is possible to do the TMB in winter, but only on skis or snowshoes. You should only undertake this if you are an expert ski mountaineer or have used snowshoes on many occasions in remote and challenging environments.